A flag that is inclusive. Is that what you see when you look at the current New Zealand flag? Who exactly is it including...? To me a flag is more than a piece of cloth, it's more than just a national icon, it's the face of our country to the rest of the world, it is what we hang our pride on and what brings us together as a multicultural society -- it's the one thing that we should all be able to relate to as individuals, no matter our heritage, ethnicity, religious beliefs or cultural identity. All the things that make us delightfully different should be respected, represented and reflected upon that cloth. 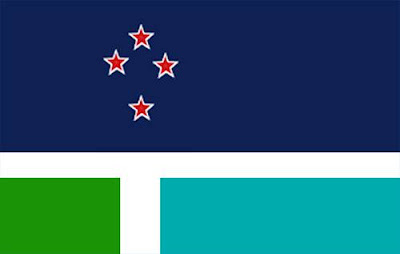 I ultimately decided to participate in the governments initiative that called on all Kiwi's to put forward a design for a flag referendum (the first of its kind in the world to my knowledge) because growing up half-Maori and half-Pakeha, I know the value of knowing and understanding ones identity and if there is anything that I have learnt in the past 32 years it's that being proud of where you come from and who you are is invaluable, that's why I would like to propose a more inclusive flag, a flag that acknowledges what makes us unique, whilst at the same time making it culturally sensitive and timeless. The new flag must reflect on who we were yesterday, consider who we are today and anticipate who we want to be tomorrow. To help me achieve this, I did some research on flag design and came across a great read called, 'Good Flag, Bad Flag', compiled by Ted Kaye. 1. Keep It Simple - The flag should be so simple that a child can draw it from memory . . .
2. Use Meaningful Symbolism - The flag’s images, colors, or patterns should relate to what it symbolizes . . .
3. Use 2-3 Basic Colours - Limit the number of colors on the flag to three, which contrast well and come from the standard color set . . .
4. No Lettering or Seals - Never use writing of any kind or an organization’s seal . . .
5. Be Distinctive or Be Related - Avoid duplicating other flags, but use similarities to show connections . . . I've used complimentary colours that reflect the natural beauty found around our country. I've intentionally avoided black as I associate that colour with death and the national rugby team. I've designed the flag to look contemporary and minimal so that it is easy for a child to draw from memory and so that it looks distinguishable at any angle, scale or format. No lettering or seals - CHECK! Be distinctive or be related - CHECK! There is no other flag out there like this design, this should solve the embarrassing confusion between the Australian and New Zealand flag by those unfamiliar with the differences between the two lands from down under. Anticipate who we want to be tomorrow - CHECK! (I believe New Zealanders are constantly mindful of our natural environment, we pride ourselves on being "100% Pure NZ". We are an isolated island nation built out of our native flora and fauna, it's what makes our land unique, it also sustains and nourishes us, not only as a people but also as an economy. Aotearoa will always be a world leading nation when it comes to valuing our land, sea and sky and it seems only fitting then that the flag is all about this natural, beautiful environment we cherish. All New Zealanders enrolled to vote will be asked to take part in two referendums. 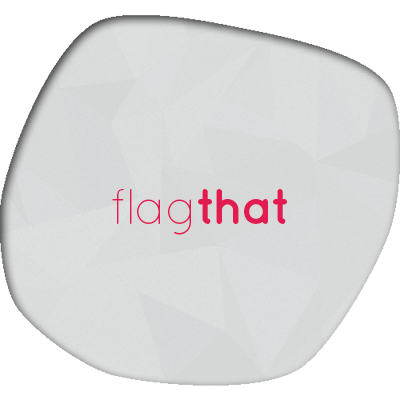 You’ll be asked to rank the four flag alternatives selected by the Panel. 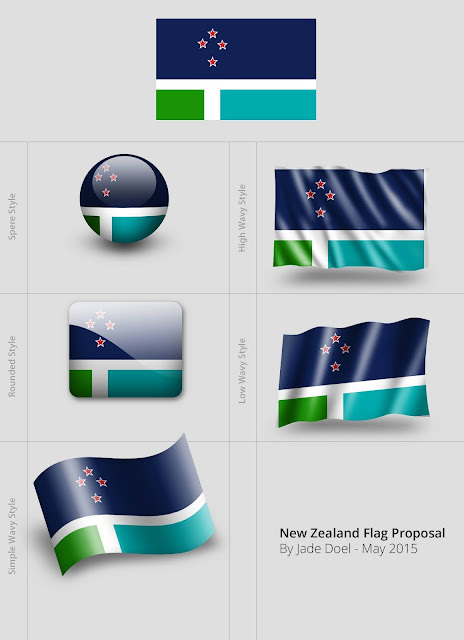 Rather than picking one favourite, you’ll be ranking the flag options from your most preferred to your least preferred. You’ll be asked to choose between the current New Zealand Flag and the preferred alternative design selected in the first referendum. The results of both referendums are binding. 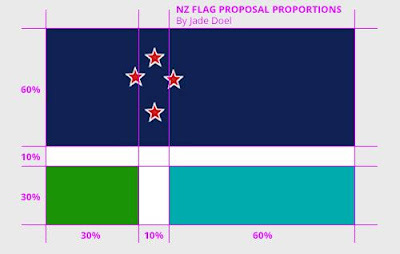 This means the flag with the most votes in the second referendum will be the official flag of New Zealand. There will be full instructions in your voting pack for both referendums, so you’ll get all the information you need to help you complete your voting papers. have lived in New Zealand for more than one year continuously at some time in your life. "Every great nation deserves a great flag!"